Get prepared for Making Tax Digital. Find out how QuickBooks helps you store your digital records securely and file VAT directly with HMRC. Want to make sure you’re compliant with the new HMRC Making Tax Digital (MTD) regulations? If you’re currently using a manual or Excel-based system, there’s a lot for you to think about. The simple solution is to get set up in QuickBooks. MTD is the biggest shake-up of tax laws in a generation, bringing tax into the digital age. From April 2019 all VAT-registered businesses need to keep electronic records of their transactions. They also have to submit their VAT data to HMRC digitally, every quarter. "QuickBooks makes it easy for you to meet HMRC’s requirements for MTD." QuickBooks makes it easy for you to meet HMRC’s requirements for MTD. With QuickBooks you can log all your transactions accurately with VAT information, ready to submit electronically in compliance with HMRC’s new digital tax rules. 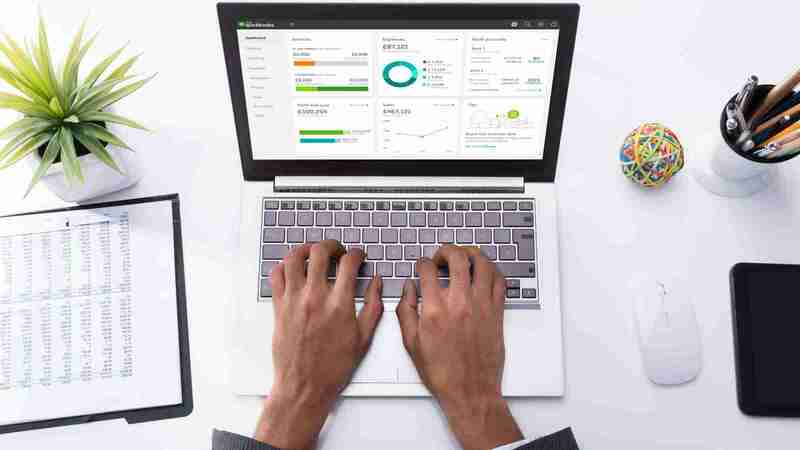 Plus, you’ll find QuickBooks is loaded with features to keep your business moving after April 2019. There are two ways to get set up in QuickBooks. Both cover everything you need for Making Tax Digital. This quick set-up should only take you about half an hour and is a good choice if you’re keen to start exploring QuickBooks as soon as possible. Set up your company information. Select the gear icon on the top menu bar. From the drop-down menu, select company settings to fill in your company information. You’ll want to update your company name, contact information and company address as a minimum. You’ll need to fill in all your VAT details to make sure your digital submissions to HMRC are accurate. Go to the VAT tab on the left-hand menu. From there, you’ll see all VAT details. Make sure you enter your VAT registration number, your VAT scheme and filing frequency. Once you’ve set up your company and VAT information, you can send your first invoice. QuickBooks will capture all relevant MTD details for you, ready to submit to HMRC. Eventually, you’ll want to complete the full set-up to get the most out of QuickBooks. "This is the most important part of your bookkeeping, so take the time to get it right." This is the complete QuickBooks on-boarding experience. It could take two to three hours, but when you’ve finished you can make the most of all of our efficient tools that typically save users around eight hours every month. Set up your full company information. Once you’re in QuickBooks, select the gear icon on the top menu bar. Select ‘Company Settings’ in the drop-down menu and set up all your company information and preferences. Go through all the tabs on the left-hand menu to edit the settings to reflect your business’s needs. If you’re keeping track of customers, suppliers or inventory on email or a spreadsheet, move them all over to QuickBooks. Just select the gear icon on the top menu bar and then ‘Import Data’ under ‘Tools’. You’ll see a list of three different types of data: ‘Customers’, ‘Suppliers’ and ‘Products and Services’. If you’re importing data from Excel, you need to convert your spreadsheet to a CSV file first – it’s easy, but you might want to follow our step-by-step instructions. Customise your Chart of Accounts. This is the most important part of your bookkeeping, so take the time to get it right. Before you begin, make sure you have the details of your business’s bank, savings, credit card and PayPal accounts as well as your company’s assets, liabilities, income and expenses. These details will help you keep track of your business’s overall health in the long term. From your QuickBooks dashboard, go to the ‘Accounting’ tab on the left. Here, you’ll see a pre-populated Chart of Accounts. This is just your starting point. You can add or delete accounts as well as changing the names to terms that make sense for your business. Fill in your VAT details. You need to get your VAT information in order, so your account is MTD compliant. Go to the VAT tab on the left-hand menu. Then enter your VAT registration number, your VAT scheme and your filing frequency. Finally, connect your business’s current and credit card accounts to QuickBooks so it can sync your transactions from the last 90 days. This will save you from having to do lots of data entry, and it will keep your business’s books up-to-date automatically moving forward. On the home page, under ‘Bank Accounts’, select ‘Connect an Account’. Then just follow the steps and repeat for all other accounts you have. Whether you follow the quick or full set up, you’ll be compliant with Making Tax Digital. All customers have access to our free, award-winning customer success agents through UK-based telephone support or online chat. You can sign up for a free 30-day trial. Feel you’re better informed about Making Tax Digital? The QuickBooks blog covers a wide range of business-related topics – it’s all part of our mission to help small businesses grow.